What is ecoSolargy and who are your customers? ecoSolargy is a full service solar solutions provider. We offer solar components as well as develop strategies and installation solutions. Our primary customers are contractors, project developers and building owners, but we also provide products to homeowners through their solar panel installers. Is your business limited to the USA or are you marketing internationally? Our business is currently focused on the U.S., but we have plans to expand our global footprint in the near future. You are launching three high-efficiency module lines. What are their key features? The new high-efficiency, black-on-black Lotus solar modules come in three different wattages to fit a variety of solar projects. The Lotus panels are engineered using nanotechnology. Unlike regular solar modules, nanotechnology-built panels have a smooth surface that prevents water, dust and dirt accumulation, making them self-cleaning, anti-fading, anti-fogging and anti-bacterial. The modules’ buildup resistance improves solar energy absorption by up to six percent and increases efficiency by 35 percent over a 20-year period. This feature also eliminates the need for periodical cleaning maintenance and ensures the panels are always performing at maximum efficiency, resulting in cost savings equivalent to a three to five year decrease in payback time. The Lotus series also offer excellent performance under low light conditions and the black aluminum frames withstand the severest environmental conditions. Our Apollo and Zeus mono-crystalline photovoltaic modules come in five different wattages that adapt to many budgets and project sizes. In addition to durability benefits –including corrosion and high wind loads resistance – both Apollo and Zeus panels rank high in performance. The Zeus 300W module has the second highest PTC rating out of all 300w mono crystalline PV modules in the market; the Apollo 250W module, when combined with a M215 micro inverter, delivers one of the most efficient system performances in the market. We are also revamping three of its existing module lines. The Alpha, Orion and Titan series have been improved for maximum efficiency and cost-savings. All the updated panels have more power, are more efficient and ensure quicker investment payback. All of our photovoltaic modules are highly efficient and reliable. Each panel undergoes meticulous quality inspection, which has earned us a 99.9 percent success rate. The company’s racking and inverters are provided by industry leading partners that meet strict quality requirements. All ecoSolargy solar panels have a ten-year workmanship warranty, as well as a 25-year performance guarantee, and can be financed through the our financing program. How do the new lines achieve a payback time reduction of up to five years? The self-cleaning feature in the Lotus module line eliminates the need for periodical maintenance and ensures the panels’ efficiency is never hindered by buildup. These benefits result in considerable cost savings that equate to a three to five year decrease in payback time. Apollo and Zeus are also top-performing modules. ecoSolargy has manufacturing facilities both in China and Taiwan. What other services do you provide and how do you outdo the competition? In addition to providing solar components, we develop strategies and installation solutions. At ecoSolargy, we outperform the competition by focusing on saving time and money for our customers and offering high-quality, top-performing products. We offer the convenience and fast delivery of a local distributor, but are committed to maintaining manufacturer-direct pricing, regardless of the order size. Our products rank high in performance and our quality assurance program guarantees their quality and reliability. All our panels must pass a strict quality control process that has earned us a success rate of over 99.9 percent. Is the solar market still growing in North America? The market is absolutely growing. Electricity cost is still on the rise, and the cost of going solar is continuing to decline. This means the ROI to go solar is continuously shortening. There is also an increasing number of people who are environmentally conscious, and understand the impact of fossil fuels on our environment and the benefits of renewable energy. 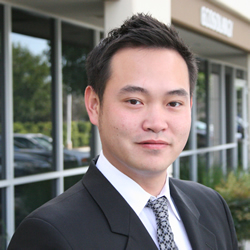 Alan H. Lee is the founder and CEO of ecoSolargy. Lee’s entrepreneurial spirit and commitment to the environment led him to found the Southern California-based solar solutions provider. Prior to establishing ecoSolargy, Lee was a Program Manager at AECOM, where he supervised environmental programs for refineries, ports and military bases. Lee holds a Bachelor of Science in Environmental Engineering from UC Irvine.